Sarah Palin has decided to respond to criticisms over her recent mistake of calling North Korea an American ally, and she did so in typical Palin fashion by attacking the media, claiming victimization, and mocking the president. In Palin's newest Facebook masterpiece, she opens with a paragraph ripping from some of the many verbal errors that Obama has made over the past two years. For example, she starts her note by sending a Thanksgiving message to all 57 states. "Of course, the paragraph above is based on a series of misstatements and verbal gaffes made by Barack Obama," wrote Palin. "If you can’t remember hearing about them, that’s because for the most part the media didn’t consider them newsworthy." I thought this was interesting. 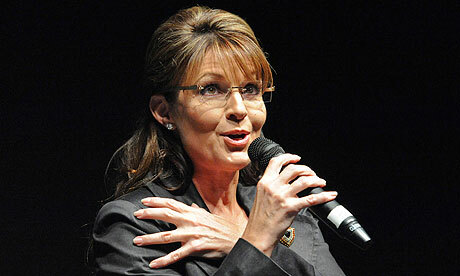 Palin is attacking the media for supposedly not reporting on some of the president's verbal gaffes. This argument is nothing new - conservative site Newsbusters posted the same story two years ago when Obama made his "57 states" comment, claiming the media failed to report on his error, while in comparison, they dedicated much time making fun of Republican vice-president Dan Quayle for misspelling the word "potato" in a 1992 elementary school spelling bee. I want to focus on the "57 states" comment for one reason - it is perhaps the most popular Obama gaffe amongst conservatives. It has appeared all over right-wing media and the internet for over two years, with conservatives even using the mistake as an attempt to link Obama to Islam - even Rush Limbaugh tried to used the gaffe to insist Obama visited 57 Islamic states in one of his numerous media tweaks. I remember having to dismiss claims from coworkers at the time that Obama was a crypto-Muslim and they would reference his Islamic slip. I wonder why. Now consider this - all of these mistakes that Palin references in her Facebook note are examples of Obama errors that the mainstream media supposedly did not cover, but non-traditional sources of news did. These same non-traditional sources are the ones that also tried to paint Obama out as a secret Muslim, claimed Obama was trying to set up a civilian army, and insisted he bowed to foreign leaders (and the mayor of Tampa) as a sign of American subjugation - there are plenty more examples that I have yet to mention. So basically, the point I am trying to make is that Palin criticizes the mainstream media for reporting on things that the non-traditional media traditionally reported on... and then goes on to praise non-traditional media over the mainstream media - her only problem is that they have decided to focus on her. I am not trying to put down blogs and online websites, but I found Palin's statements to be very hypocritical. Also, the president never claimed that one of the "Axis of Evil" was our ally on cable television - I think that screw up trumps not being able to name that thing people with asthma use (inhaler) or saying you visited 57 states. Palin constantly tries to draw comparisons to others in proving that she is right, but she constantly fails - it reminds me of that great Peggy Noonan piece that called Palin a "nincompoop." Why does Palin always have to blame someone else for her problems? An easy solution for Palin would be to actually take the time to become educated about a subject instead of rattling off a bunch of lies and crying on Facebook and Twitter. Doing so would reduce the amount of material critics can use against her. While reading Palin's note, I decided to check out her other recent Facebook proclamatations to see what other pearls of wisdom I was missing out on. I thought her feminism rant from her "America By Heart" book was worth mentioning because it highlight's just how delusional Palin is. Palin wrote that "some people are calling the emergence of these successful conservative female leaders a new phenomenon in America." By "some people," Palin means herself. Also, Palin wrote the following: "The women’s groups and mainstream media have greeted the rise of the conservative mama grizzlies in much the same way they treated the vice-presidential campaign in 2008: with disbelief that people so alien to them could win the support of the American people." In this public opinion poll from earlier this year, 55 percent of Americans had an unfavorable opinion of Sarah Palin, meaning Palin was only able to win support from a minority of Americans. Who is Palin trying to fool? The reason this misstatement is so critical is 30 months ago Sarah Palin had no idea where North or South Korea was or which one, if any, was our ally or enemy. As a result, it is not surprising she gets them mixed up and is the reason she will not do any interviews except for the Faux News tributes. Assuming she is the Republican nominee, the debates will expose her. Expect more screw ups in the mold of Gerald Ford statement regarding Poland. Rove knows this and this is the reason he is so against her. Context is also important. Obama was originally trying to make a point that he has visited all but one of the contiguous United States which is 47 states, and he started by saying fifty instead of 40....realized somewhat was amiss (by the pause before the 7) but was kind of invested and probably decided a flub on something so trivial could be forgotten on the tiring campaign trail. Unlike Palin, who is not under all the campaigning stress (or lack of sleep), who is not speaking on a trivial topic, and where she is trying to come across as some sort of crdibile expert.